This easy healthy dinner recipe contains affiliate links. When I was a child, my mother used to prepare ratatouille every week! 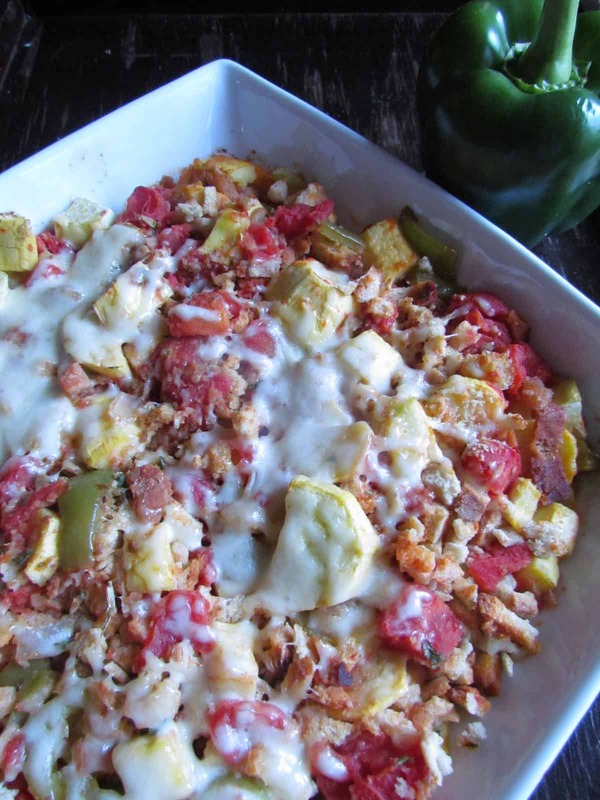 Ratatouile is French Vegetable dish that contains Eggplants, tomatoes and several other vegetables! It is similar to this easy healthy dinner recipe I made a while ago: Eggplant in the oven! Unfortunately my husband decided that he no longer likes the eggplants! Maybe because I served them too much! (You know when you find an easy healthy dinner recipe, you keep on cooking and cooking it, over and over until someone raises his hand and says: ENOUGH). This is what what happened with the eggplants! I had to come up with a new variation of this dinner recipe! A variation that had color, taste and something new and original! Isn’t always a headache to come up with a new dish? 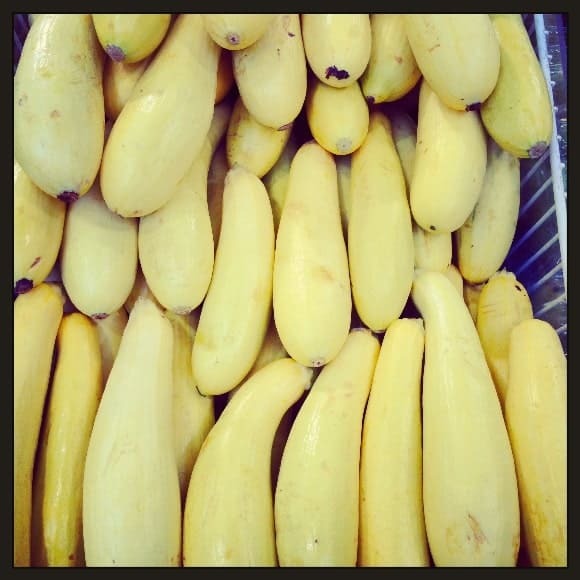 While I was strolling the isles at my grocery stores, I stumbled upon those Yellow Zucchinis! It is the first time I notice this kind and wondered what It would taste in a ratatouille dish! Happy with my new idea, I bought few zucchini! As soon as I got home, I started on my new cooking project! I am always excited to try new ingredients! Aren’t you? 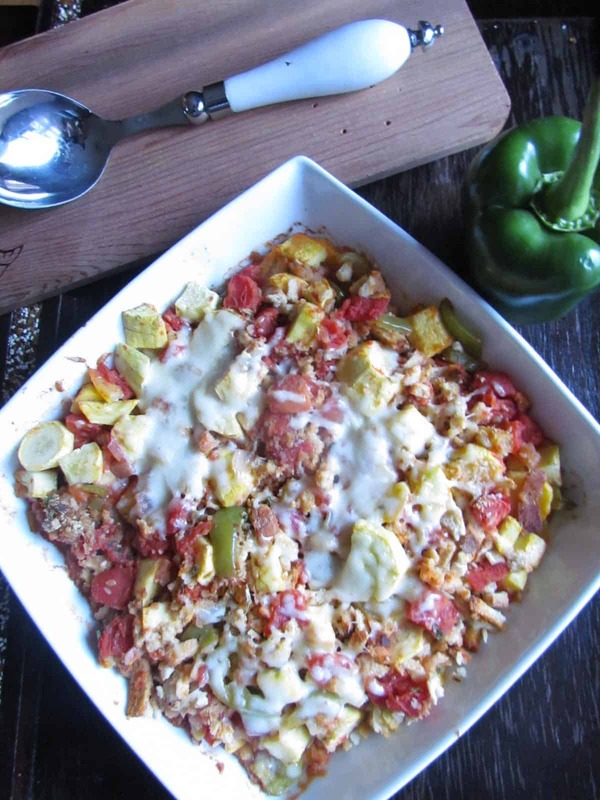 Ratatouille Dish: A Vegetable fiesta for an easy healthy dinner recipe! 1 tablespoon of olive oil! I usually use Bertolli Extra Virgin olive oil! 1 TBSP of minced garlic! 1 Can of diced tomatoes! In a large skillet, heat olive oil. Make sure not to over heat it! Add the zucchini, onions and peppers! Cook until it becomes crunchy! I cooked it for around 10 minutes! Add the stuffing mix and stir! Spray a baking pan with a cooking spray or some butter! Cover and bake for 30 minutes! Make sure to uncover for the last 5 minutes! I baked this recipe on a Sunday morning along with a spinach lasagna! Sunday is my cooking day! I wanted to serve the ratatouille bake for supper and the lasagna for lunch! But as soon as my husband entered the kitchen, he said: what’s this nice smell? I want to try it! Usually I don’t like changing plans but I was so happy to serve my new dish that I switched and we ate this delicious dinner recipe along with a roasted pumpkin soup! How about you? Have you ever baked a ratatouille? Did you leave the shells on the yellow squash? I made this for dinner last night and it was very tasty. I started to put away the leftovers and had an idea: I took a quarter of the recipe and put divided it into 6 muffin cups. Then I poured egg into each cup and cooked at 400 degrees until done. I’m now having it for a healthy breakfast! I personally used Egg Beaters and reduced fat cheese to keep it even healthier. Thanks for the recipe! This recipe sounds good but I am not a fan of eggplant. It is weird tasting too me. Oh my goodness Olfa this looks so amazing. I would never think of making this on my own. Thankful that you shared this unique recipe. I will try it.